Hired Killers’ more than 60 years in service have made them a staple in the Upstate. Thanks to word-of-mouth and traditional marketing methods, Hired Killers has managed to capture a steady amount of business throughout the years. With over 600 positive Google reviews, the company’s reputation for excellent service is beyond apparent. However, when they approached us in May of 2016, they knew that their website was causing them to miss out on potential new customers. Overall, the site didn’t offer users a clear path to the information they were seeking, nor did it pay homage to the company’s rich history. Because today’s buyers are so independent, it’s crucial to capture them where they are: on the web. Hired Killers wanted to do just that. To better engage Hired Killers’ audience, we were tasked with building a mobile-optimized website that would allow users to schedule appointments and pay their bills online. 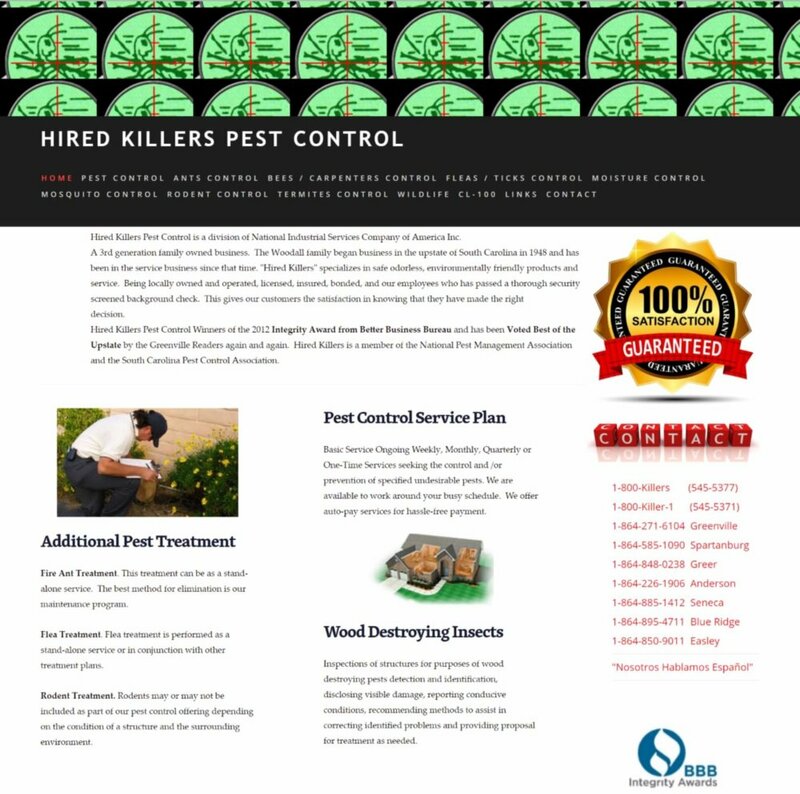 In addition, Hired Killers wanted their new website to better showcase their long standing reputation and credibility. Focused on improving the user experience on the site and creating a clear path for users to find the information they’re seeking, we included buttons in the utility navigation at the top of the page and a strategic call-to-action in the site’s hero image. Specifically, these links lead users to pages where they can pay their bill, schedule an appointment, and “contract a killer” (another way to contact the company for service). These highly prominent calls-to-action are doing their job: since the site launched, more than 40% of users navigate from the homepage directly to these specific corresponding pages. We highlighted Hired Killers’ outstanding reputation and credibility by including a section on the homepage that features their Better Business Bureau rating, lists featured reviews, and explains their dedication to local service. 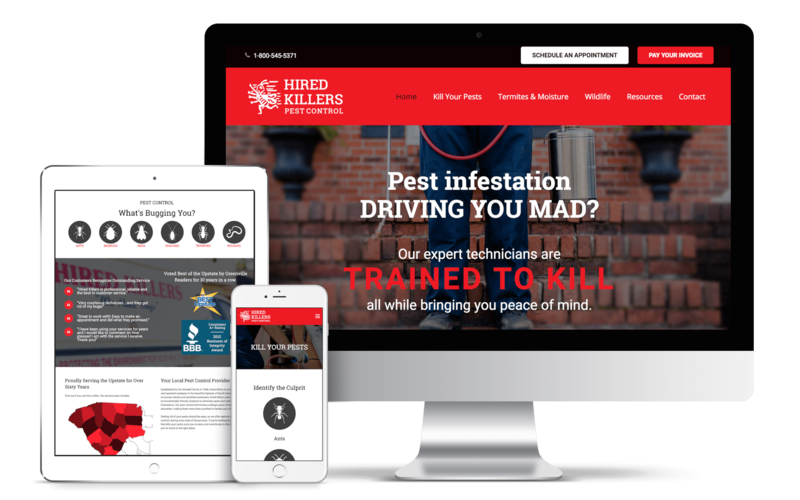 We also aimed to draw attention to the Hired Killers brand as a whole—their previous website lacked the company logo and the vivid red color that their customers know so well. In addition to better engaging current customers, we teamed up with the goal of driving more quality traffic to the site, in hopes of attracting even more new customers. We performed standard Search Engine Optimization (SEO) setup tasks in December 2016, including plugin installation, Google Analytics configuration, and more advanced keyword research and on-page optimization. We expect any SEO campaign to go through an adjustment period after setup tasks are performed. In this case, we performed setup tasks in December. Sure enough, after three months, Hired Killers experienced a significant uptake in website traffic from organic search. In March 2017, the fourth month of SEO services, the number of sessions from organic search was more than triple the month before. Since this initial uptake, Hired Killers’ website traffic has remained steady. Organic search has remained the company’s primary acquisition method for the duration of the campaign, accounting for more than 66% of all website sessions—more than 4 times the average.